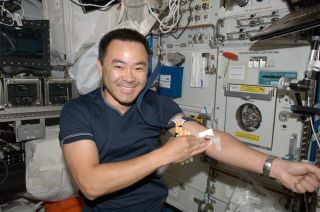 Akihiko Hoshide, an astronaut with the Japan Aerospace Exploration Agency (JAXA), posed for a photo after drawing a blood sample aboard the International Space Station during Expedition 32, which lasted from July to September 2012. Life in space does strange things to the human body — it stretches the spine, it turns muscles to jelly, and now new research led by NASA shows that spaceflight confuses the immune system, too. Scientists found that the immune systems of 28 astronauts seemed to be temporarily altered during their six-month missions aboard the International Space Station. It's not yet clear how these changes arise, or whether they pose serious medical risks to today's astronauts. But the findings suggest future spaceflyers on longer missions to Mars or an asteroid could be more susceptible to illness. Crucian and colleagues looked at blood plasma samples from the astronauts taken before, during and after their spaceflights. The scientists found that the distribution of immune cells in the blood was relatively unchanged throughout the mission. But some cell activity was quite depressed, and the immune system was not producing appropriate responses to threats, the researchers said. This might explain why some astronauts experience "asymptomatic viral shedding." This phenomenon, described in previous studies, reawakens latent viruses — including common herpes viruses like chickenpox and cytomegalovirus (CMV) — but without any symptoms of illness. The researchers also found that some cell activity was heightened, and the immune system was having an overly aggressive reaction. This could explain why some astronauts experience increased allergy symptoms and persistent rashes. "These studies tell us that this is an important issue and that we are measuring the right things," Mark Shelhamer, chief scientist of NASA's Human Research Program, said in a statement. "They also tell us there is no place during spaceflight where we see stabilization of the immune system. This is critical as we pursue longer duration missions and why we are studying this further during the upcoming one-year mission." Next spring, NASA astronaut Scott Kelly will embark on a yearlong mission aboard the space station alongside Russian cosmonaut Mikhail Kornienko. Kelly's twin brother, retired NASA astronaut Mark Kelly, will serve as an earthly control as NASA scientists probe how spaceflight changes the human body.